Ousmane Sembène, prolific writer and film producer, was born in January 1923 in Ziguinchor, Senegal. Official documents were rare in 1920s French colonies, so even though Sembène was officially listed as born on the eighth of January, he says that it is likely that he was actually born eight days earlier. Sembène was born a French citizen, thanks to his father Moussa Sembène, a fisherman who was from the region Senegal where such citizenship had been extended in the 19th Century. His mother was Ramatoulaye Ndiaye. His parents were together only briefly, and Sembène was raised by his maternal grandmother after his mother moved to Dakar. Sembène attended colonial school until the age of fourteen when he was expelled for retaliating against a French teacher who hit him. He then moved to Dakar where he was employed in various jobs including plumber and bricklayer. In 1944 Sembène was drafted into the French Colonial Army for his 18-month compulsory service. He served with the Sixth Colonial Regiment in Italy and Germany, among other fronts. In 1948 he moved to France, becoming a dock worker in Marseilles. It is in France that Sembène became political, first in becoming a trade unionist and then in 1950 when he joined the French Communist party. In 1956 Sembène published his first novel, Le Docker Noir (The Black Docker), beginning his forty-year career of writing and publishing and producing. His most well-known work, God’s Bits of Wood, appeared in 1960. After Senegalese independence in 1960 he returned briefly to his home country before spending the next two years (1961-1962) studying film at the Max Gorki Studio in Moscow. His first film, Borom Sarret (Cart Driver), was produced in 1963, winning first prize at the Tours Film Festival. In the next fifteen years Sembène held positions either on the jury or as jury president at film festivals around the world, including Cannes, Carthage (in Tunisia), Moscow (in Russia), and Rio de Janeiro (in Brazil). In 1968 he began writing in his native language of Wolof, and that year he produced Mandabi, his first Wolof film. Sembène used his writing to express his political ideals and speak out on societal issues. His works conveyed the conflict between Africans and colonialism, and his films were integral in the changing of the Western perception of Africa. Most of his writing was in French because he believed that writing in a European language was the only realistic option, as much of Africa remained illiterate. As seen in his use of Wolof, Sembène became an advocate of the use of indigenous African languages to create a local literary tradition. For the latter half of the 20th century Sembène produced poetry, short stories and novels. In the first decade of the 21st century he produced films that described Africa and his native Senegal. 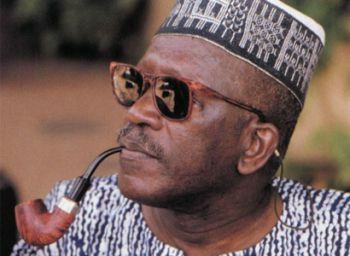 Ousmane Sembène died on June 9, 2007 in Dakar, Senegal. He was 84. Brian Cox, African Writers (New York : Charles Scribner's Sons, 1997); Samba Gadjigo, Ousmane Sembène: the Making of a Militant Artist (Bloomington: Indiana University Press, 2010); Annet Busch and Max Annas, Ousmane Sembène: Interviews (Jackson: University of Mississippi, 2008).